Monitors your bandwidth. (Daily, weekly, monthly etc). Dial up time + Download monitor which shows real time speed. Download Monitor, a kind of freeware version of DU Meter. 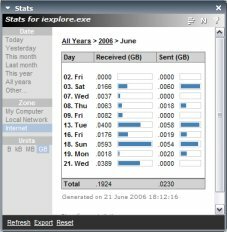 NetMeter is a small, customizable network bandwidth monitoring program for Windows. Free for personal use. No adware or spyware. In addition, LeechGet provides many features, such a automatic downloading, resume of broken downloads, a download timer, automatic hang-up and shutdown and more. A built-in web parser lets you download complete website with all images and scripts in no time. LeechGet also provides a history of your downloaded files, sorted by day, week and month. Additional features include a file drop icon, a speed monitor and much more. 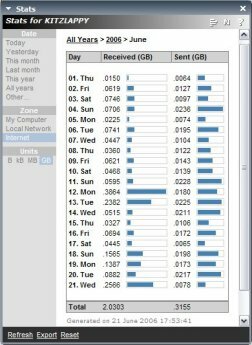 From the makers of the most well known internet traffic controller comes NetLimiter 2 Monitor which is a free download monitor. 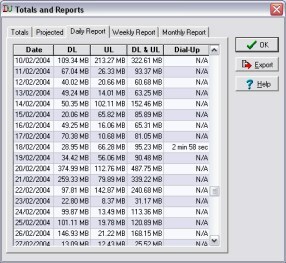 NetLimiter2 differs from the other download monitors in that it records traffic from each application that has accessed the internet. The Main window shows the current speeds of your download for each application and gives an overall download speed of traffic coming through to your PC. You can also access stats over hour/day/month/year which can be broken down further into which application has used how much bandwidth. This allows you to check how much of your bandwidth is used on surfing/mail/ftp/p2p etc.